Are you looking for a small business ideas ? When you want to start your own business but do not have too much budget .This page will give you a good inspiration and ideas. Did you know about mall kiosk before ? In fact ,mall kiosk business has long been recognized as a low-end markets in past few years. However , in recent decades , we gradually find out that mall kiosk business is become a very hot and popular trends . One of the latest research shows that those small kiosk stall and short-term leases has even occupy 15% of total mall’s sales . 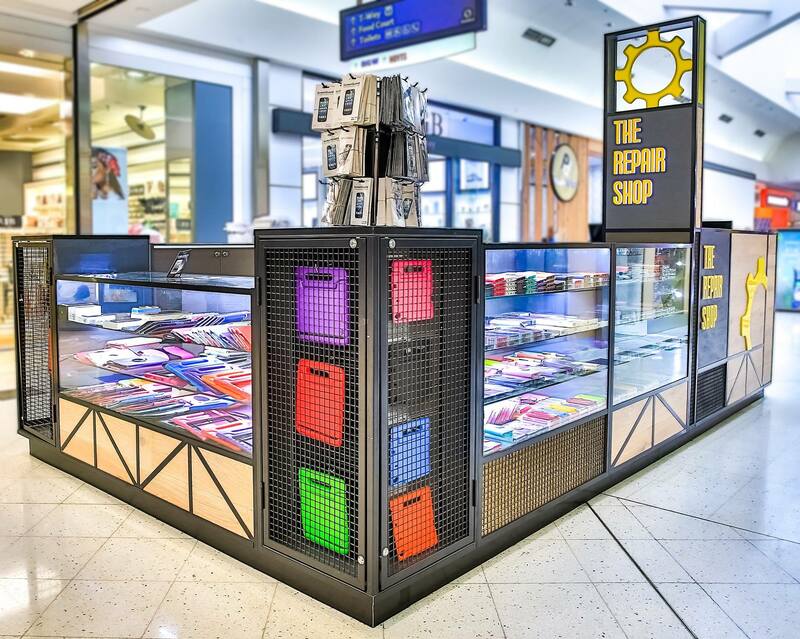 Invest on a mall kiosk retail business becoming the first choice for many business starters. With less investment and easy management. Mall used retail kiosk business models are attracting many business owners and starters. Even some bigger brands join to expand franchise business territory. Unique Kiosk has been building mall kiosk for over 15 years, We have witness dozens of different franchise business options from small growing to big. And we successfully worked with several brands and help them finish franchise business development. If you are hunting for a small business idea to start with. Here below are some proved no lose treads and new business venture you can take into consideration. 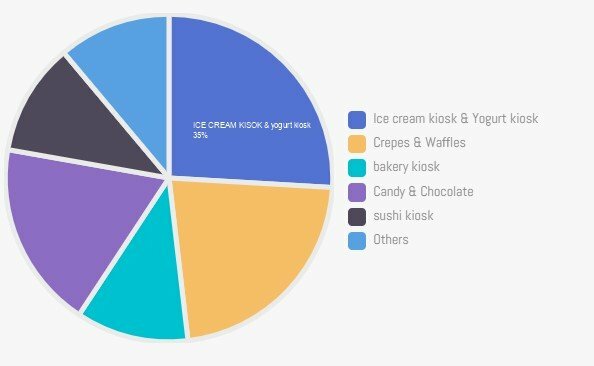 According to our experience and large data analysis, we notice that food kiosk in mall is the most popular and easy success business idea. There is and will always be a huge demand for a different taste of food. After all, No one can resist the temptation of delicious food. You can see almost every mall has a lot of food kiosk stall with crowded customers. A nice and fine food serving will be the key to success. 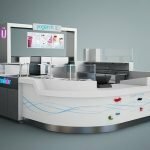 Well, a unique design food kiosk to grab attention will be also very important. So what types of food business are the best ideas to start? Here right side is the chart to classify all the different food business volume in mall. Ice cream and yogurt are the most popular food concession. While crepes waffles take the second seat. Bakery kiosk actually has a large product line. You can serve french baguette, cupcake, baked cake, and even egg tart in this kiosk. Candy and chocolate are also very popular trends business venture. Sushi business is a new dark horse in recent years As sushi is considered a kind of healthy food, more and more people are stick to it. The others food kiosk business ideas in mall that you can do are small category . such as donuts and churros. Chips and potato. Because those types of business will need to fry and have oil smoke. Mall will require you have an exhaust dispose of equipment and fire extinguishing system installed in the kiosk. Oh, I almost forgot.S weet corn kiosk, cup corn, popcorn, and kettle kiosk in mall are also very hot in recent years. Are you interest in one of those ideas? If not, check here below more options. Why I take coffee kiosk business a single business idea into number 2 position? Coffee and espresso is a consideration as the most consumed drinking beverage in the world. In western countries, Drink coffee is not a taste but more like a habit of life culture. Everyone drinks coffee everywhere and every day. A gourmet coffee kiosk in mall with aroma emanated from newly roasted coffee beans will grab everyone’s attention. Some of the coffee kiosk sales even exceed cafe in-store coffee shops. Coffee and espresso have such a large potential customer group that makes this business a safe investment. To start a coffee kiosk in mall will cost you more money compared to other food business ideas. If you are short of budget limited. A mobile coffee cart, free-standing coffee vending stands will also be a good start. Similar to a food court, Juice bar and beverage kiosk are always a hot spot in mall. When you shopping around the mall and get thirsty or tired, A nice fresh juice bar in front of you will refuel your whole body with energy. You do not need to invest too much on equipment on this type of kiosk, but the immense financial rewards are beyond your imagination. 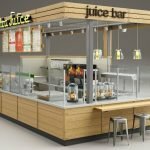 Fresh juice bar as a typical classic beverage kiosk in mall has some similar kinds of trends. Such as green tea kiosk, bubble tea kiosk, and smoothies bar etc. One of the business has a very eye-catching performance in every mall that is bubble tea. Many business owners start a smaller kiosk at the beginning and soon franchise several kiosks all over the continent. As for cell phone kiosk in mall do not have a very long history. We all know that smartphone just popular in recent years. However, cell phone soon becomes an intimate part of our life that no individual can get away from it. Everyone will own one smartphone or more. So cell phone retail kiosk in mall will be a very good business idea to start, You can also sell electronic products in those retail kiosks. Such as laptop, tablets, audio or some other accessories. When your cell phone goes wrong, You need to take it to see a doctor. Imaging that there are so many cell phone working. every phone are Mechanical products and has the possibility goes wrong, then you need to get it fixed. Some smart businessman opens a cell phone repair kiosk in mall are just feed this huge need. To open a cell phone fix kiosk in mall is definite a proved safe invest to succeed. Most of the cell phone repair kiosk will not only just to repair service. They will use the space as much as possible to display cell phone accessories like phone covers, batteries, chargers, earphone etc. Don’t look down upon the accessories, The sales of those small items can count for almost 40% of total sales volume. Jewelry retail is very old and traditional business treads since mall begins. Have you ever wondered that’s why every big mall will have jewelry retails? jewelry is expensive, they do not have too much customer every day. How can those businesses survive? This is because jewelry retails sell only for a special customer on a special day. You may not rich enough to buy a piece of interesting jewelry at any time. But for birthdays and anniversaries, you can’t stop to buy a unique gift for your intimates or yourself. Jewelry retailer has many great ideas to present merchandise. However, invest in a jewelry kiosk need a big investment not suitable for beginners. Perfume retails is considered to be an alternative option to go. If you can not afford luxury jewelry, You can buy a small perfume as a gift instead. fragrances and perfumes sales have grown very fast in the beauty industry. And will continue growing in the next few decades. Open a fragrance in mall will be smart ideas that you do not to miss it. Eyebrow threading kiosk, you can do brow threading, eyelash extension, or tinting. Some kiosk even offers tattoo design service. Most of the demand is coming from women, However, many men join this arm and start to thread their brows too. Nail bar kiosk. This is especially for women beauty. You can do nail manicure and pedicure business which is very hot in the UK and USA. Teeth whitening kiosk are mall used store for teeth whitening, Compare to go to see a dentist, Many people will choose to get teeth whitening in a mall kiosk. Barber kiosk and Hairdressing kiosk are also good ideas to start. Barber kiosk in mall is especially for men and fast hair cutting service. While hairdressing kiosk is mainly for women. Those two businesses are all very suit for new starters and easy franchise. Massage kiosk or spa ideas are coming up recently. Not too much mall has it, But because of everyone seating in front of a computer too much time. So this massage kiosk will be a booming growth in recent future. To start an entertainment kiosk and game center in mall is also a very smart idea. Most of those business owners will do toys retails at the same time. Those kiosks are mainly for kids. Every parent will spend a lot of money to satisfy their children. So when you learn to play the rules you will know the profit come from. Another very new business ideas for the game is a VR experience center for young or adults. Virtual reality technology is a kind of computer simulation system which can create and experience the virtual world. It uses a computer to generate a simulation environment. It is a system simulation of multi-source information fusion, interactive three-dimensional dynamic scene, and entity behavior, which makes users immersed in the environment. This is quite a new technology and soon become a fashion among young people. Of course, There still several business ideas I do not mention here. Such as flower retail. Shoe retail. Clothes retail or crystal engraving. Painting or album making etc. In fact, For any business ides in mall, The most important part is making a profit. There are no business ideas call the best but do have right ideas that suit for you. Working more on what you are capable of and make the right decision. Another very important a issues in a success mall business is you need a high-end mall kiosk displays. A unique designed kiosk will bring you thousands of customers. At Unique kiosk.As a leading mall kiosk manufacturer in China. We provide a free design service for all of our customer . and we supply high-quality kiosks for both small retail businesses and larger brands. Our kiosk is manufactured with fine materials for structure and great interactive advertising method for the brand. We focus on detailed display solutions as well as on whole outstanding shape. Our kiosk is mainly shipped to large cities in the UK, USA, Canada, and Australia. You can easily find our work in Sydney or Melbourne, London, and New York. Are you ready to start your own business from a small business ideas ? We will be your best cooperator partner and supply you the just right display with affordable price. If you are interest in our kiosk design or want to start a new customized kiosk concept. Please feel free to contact us .